To input text information on your Droid X phone, you use the onscreen keyboard. The Droid onscreen keyboard looks similar to the keyboard on your computer. You operate the onscreen keyboard by touching its keys with your finger. The onscreen keyboard shows up any time the phone demands text as input, such as when you’re composing e-mail, typing a text message, or using any application that requires text. Using the Droid X multitouch keyboard works just like you probably expect: Touch the key you want to make that character appear in the program you’re using. It’s magic! A blinking cursor on the touchscreen shows where new text appears, which is similar to how text input works on your computer. 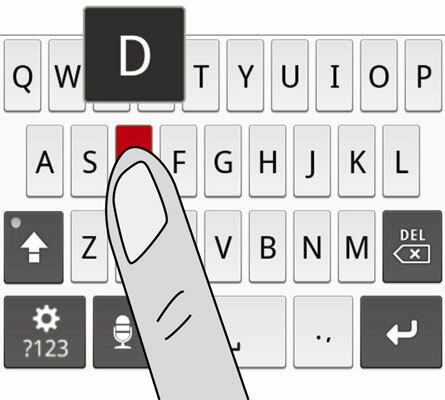 While you type on the onscreen keyboard, the button you touch appears enlarged on the screen. 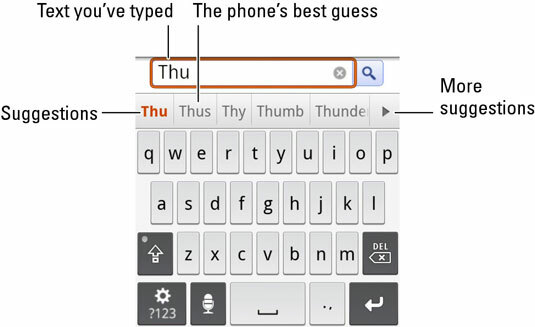 That’s how you can confirm that your fingers are touching the character that you intend to type. Adding a period automatically: You can insert an automatic period at the end of a sentence by pressing the space key twice. In fact, pressing the space key twice at any time changes the first space you typed into a period. As a bonus, the next character you type automatically appears in uppercase to start a new sentence. Accessing special characters: You can type more characters on your phone than are shown on all three variations of the onscreen keyboard. To access those characters, press and hold a specific key to see a pop-up palette of options. Extra characters are available in uppercase as well; press the Shift key before you long-press on the onscreen keyboard. Choosing a word while you type: As a smartphone, the Droid X makes a guess at the words you’re typing while you type them. A list of suggestions appears. You can choose a suggestion by touching it with your finger; the word instantly appears on the screen, saving you time (and potentially fixing your terrible spelling or typing, or both).